One of my other favourite Canadian authors, Robert Charles Wilson released his 14th novel this week. 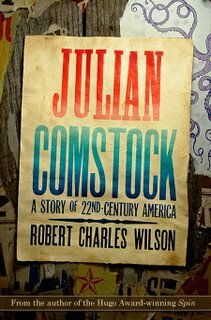 The retro-futuristic Julian Comstock: A Story of 22nd Century America tells the story of Julian Comstock heir to the presidency of a very depopulated and technological hamstrung society that looks more like 19th century America than the 22nd. Ruled in part by a religious group called the Dominon, the novel focuses on a four year window in Julian's life as told by his companion Adam Hazard. I haven't read any of the book myself, just glowing reviews of it. Personally I can't get enough of Wilson's fiction. I first discovered his work with Darwinia which was published in 1998. His work is very accessible, full of characters that are as real as your co-worker and next door neighbour, and still delivers on the big ideas in a way that is intergral to the story-telling and not just a big Wow factor that you often find in less adept SF. I just finished reading a great interview with Rob over at io9.com (see link) in which he talks about the novel and his style. My favourite part of the interview of course is where he talks about time and time travel. Here's an excerpt from the interview. io9: Many of your books have dealt with time travel or time warping ortemporal mash-ups in some way. I think the temporal juxtaposition of past and future in Julian Comstock could make it a time travel novel too. What appeals to you about messing around with time? RCW: I like to say that science fiction de-privileges the present. Past, present, future — those aren't fixed categories; they're points of view. It was the French composer Nadia Boulanger who said, "In art there are no generations, only individuals; all times have been modern." Not just in art, I would add. The quaintness of the past and the marvelousness of the future are entirely in the eye of the beholder. Messing around with time in fiction is one way we remind ourselves of that truth. Science fiction does it more consciously and consistently than any other genre, and that's one of the things I love about it. 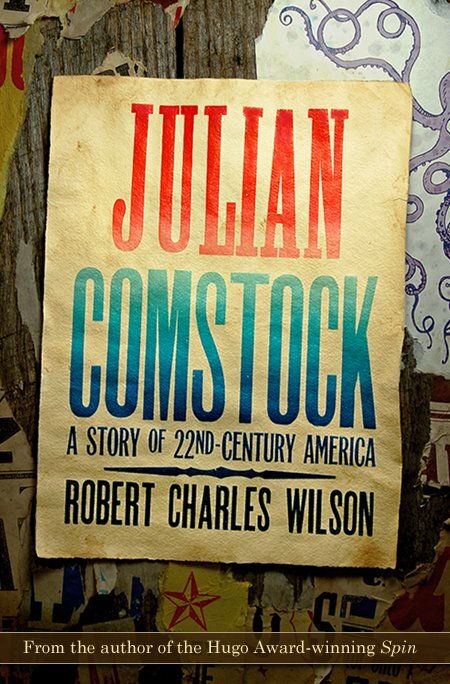 Julian Comstock is available June 23rd 2009 for sale at most book stores.